With more people wanting to mix algal filtration with zeo, we are going to look at the two main types of algal units that you can put on your system: Chaeto reactors (or "algae reactors") and algae turf scrubbers (ATS), especially with regards to interactions with zeo. We won’t be looking at refugiums however, since those have mostly a different purpose. This will be a multi-part post; the next post will start with the basics, so if you’d like anything in particular to be covered, let me know. does it work with Zeovit ? They certainly can. There is a balancing point to shoot for, in order to get the benefits of the algae. K-Balance Strong 3ml per day. I control nutrients mainly with my Rollermat, large skimmer, and reactor. I have had amazing results the past two months since everything has stabilized. G. Alexander helped me through all of my issues. 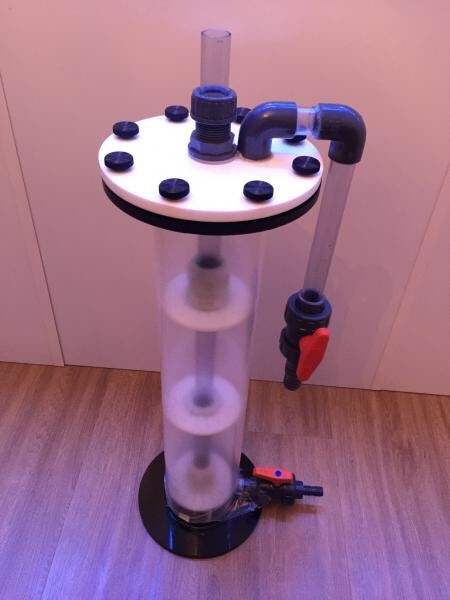 What would be the added benefit of adding an algae reactor or scrubber to a zeovit system? Not to reduce nutrients, because zeovit can do that more then adequately, if you're not careful. I ran a ats on my last tank and it worked good gone a different direction with my current tank full zeovit and can't see how the ats could work on a ulns there would be no food for the algae to grow. Would it then compete with the corals for food in an already nutrient poor environment? Would it strip the additives before corals get to utilise them? Or just never grow? I think both methods or systems work but can't see them working together. I run here zeovit and my self build cheato filter. It works great together i can feed the fishes what i want so it works. It brings the tank to this. Here my self made reactor. Well algae put some good natural things into the water like oxygen, carbs, amino's, vitamin c, and it reduces CO2 and increases pH. Lots of pods too, and in the case of a scrubber the growth can be used as food too. Well the zeo would probably need to be reduced. Would it then compete with the corals for food in an already nutrient poor environment? No, corals look more for organic food particles, not inorganic nutrients. Algae help with this, by putting dissolved sugars into the water, like in real reefs. Would it strip the additives before corals get to utilise them? No, algae does not utilize the organic additives that you dose. Algae want inorganic nutrients, especially ammonium and urea. Chaeto: Pronounced KAY-toe. Chaeto is the nickname for Chaetomorpha, and it looks like a green dishwasher cleaning pad. It has no "roots" and thus does not attach to solid surfaces. It grows in saltwater only, and is not eaten by many fish. Green Hair Algae: Includes Cladophora "angel hair" and Ulva "Easter basket" types. It has "roots" which attach to solid surfaces. It grows in freshwater and saltwater, and is eaten by almost all herbivores. Slime: A solid algal growth, bright green to brown to black in color, that attaches to solid surfaces but not very securely. 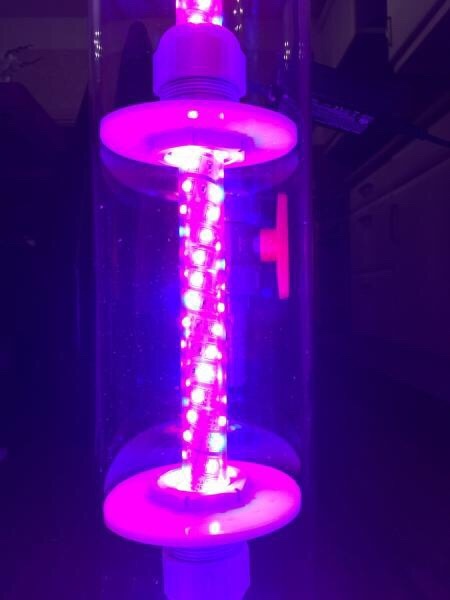 Chaeto Reactor: A device that has water running through it, with chaeto growing in it. Also known as an "algae reactor". A chaeto reactor does not allow air to enter; only water, and these reactors usually have a lid attached with screws to keep water in and air out. Algae Scrubber: Also called a Turf Scrubber, or Algal Turf Scrubber (ATS). A device that allows air and water to interact to create a turbulent air/water interface like waves on a beach; it grows green hair algae or slime that attaches to solid surfaces. Reactors and scrubbers are different from refugiums; a refugium (“fuge”) is a space in a sump where macroalgae is placed, and a light is put over it. Refugiums have very slow flow, and very low light penetration, compared to reactors or scrubbers. 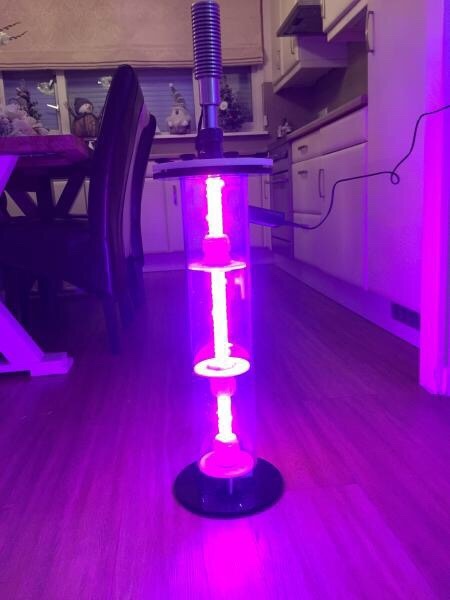 You could modify a refugium to be a reactor, and with more mods you could make it a scrubber. But then it would no longer be a refugium. All oceans, reefs, lakes and rivers are naturally filtered by photosynthesis. This means that algae does all the filtering of these waters. This is why algae is at the base of the entire aquatic food chain, and why algae biomass dwarfs the biomass of all aquatic animals combined. But for algae to absorb nutrients out of the water, the algae must grow. And to absorb nutrients faster, the algae must grow faster. Next we will look at what makes different types of macroalgae absorb nutrients differently. Now for some basic differences; more detailed differences will be in subsequent posts. The first and maybe most important difference is that chaeto reactors grow only in saltwater (fish only, or fish with live rock, or reef) whereas algae scrubbers grow (filter) in both saltwater and freshwater. Growing = filtering. Zeo compatibility however, just comes down to nutrients in the water. A second difference is size; a chaeto reactor needs to be much larger than an algae scrubber. 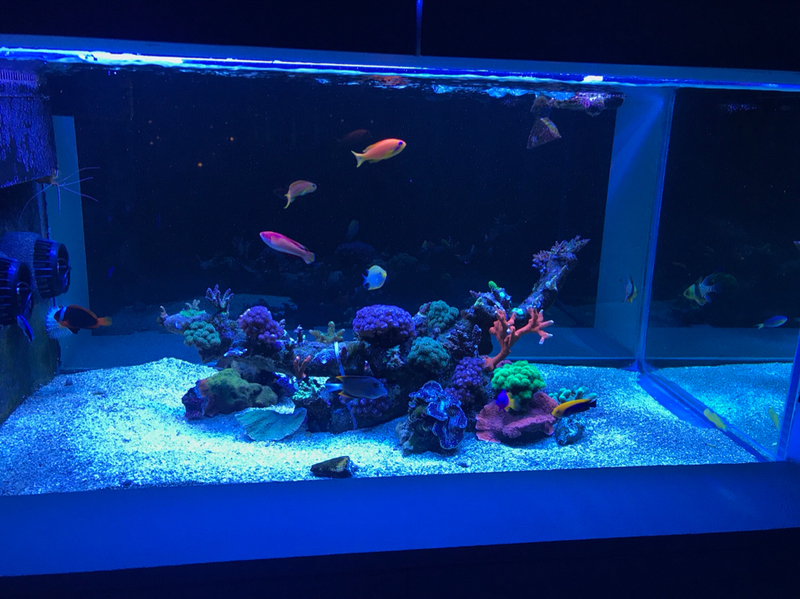 Many saltwater tanks have large sumps, and even dedicated fish rooms, so this may not be an issue. Through experiential results of individual aquarists running chaeto reactors over the last few years, and through many thousands of aquarists running algae scrubbers over the last ten years, it has been observed that a chaeto reactor needs to be 4 to 8 times the physical size of an algae scrubber to provide the same rate of filtering capacity (rate of nutrient removal). A third difference is seeding; a chaeto reactor needs to be seeded with a small amount of chaeto, either from another aquarium, reactor, or from your last harvest (i.e., you don’t harvest all of it), whereas an algae scrubber will self-seed from invisible algal cells in the water. When self-seeding, algae scrubbers usually start out with a slime type of growth, and this sometimes progresses on to a green hair algae growth, depending on the nutrients in the water. A fourth difference is in how you clean (harvest). 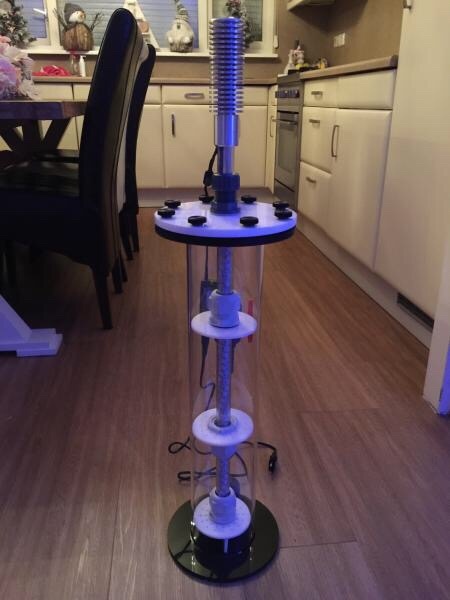 For a chaeto reactor, it's very similar to a zeo reactor; you disassemble the reactor usually by unscrewing several screws on the top of the container, and then by pulling out a tube or frame from the container; the chaeto growth is then removed from the frame and the frame is replaced back into the container, and the lid and screws are put back into place. Since chaeto does not attach to a surface, you often get broken chaeto pieces that flow into your tank or sump when you harvest; a filter screen in the reactor can reduce this. For an algae scrubber, cleaning (harvesting) varies on what design it is. A horizontal river design will have a light that you lift up off of the container, and a screen that you remove from the container. A waterfall design will have a screen that you remove from a pipe; sometimes the whole pipe is removed, and sometimes the pipe is in a container that you need to open first. A bubble upflow design has at least part of the container under water, which you lift out of the water. And for all algae scrubbers, since the growth is attached to a surface, broken floating algae pieces are not common when you harvest on a proper schedule. Bubble upflow scrubbers almost never detach because the growth is supported by the water. A fifth difference is fish feeding; by feeding your fish from the growth, the fish eat naturally and you don’t have to buy and add food to the water (which creates nutrients). Very few if any aquarium animals eat chaeto, so the only option is to remove the chaeto and either throw it away or give it to a friend. For algae scrubbers, it depends on the growth: Slime (although full of absorbed nutrients from the water) is usually not eaten by aquarium fish and thus is scraped off and thrown away or used as garden fertilizer. Green hair algae however is eaten by almost all herbivore fish and many snails (it’s their nature food), and thus some of the growth can be fed back to the fish. A sixth difference is overgrowth of algae on the lights. Chaeto reactors usually have a large surface area light (such as a long coiled light strip), and the illumination from these is not enough to “burn” off algae growth on the surface of the clear wall (this growth reduces illumination output). So you will need to clean these glass surfaces in order to keep the illumination at full output. Most algae scrubbers however use discrete (separate) high power LEDs which produce enough illumination in a small space to burn off algal growth on glass surfaces; for these you do not need to wipe the growth off because it does not grow there. A last difference is overgrowth of algae on the algae itself. Chaeto is a slow growing species of algae because of it’s thick cellular structure, and if conditions favor faster growing algae you will get green hair algae which attaches on top of the chaeto, causing the chaeto to be blocked from light and flow, and eventually causing the chaeto to die and rot. There is no easy way to wipe green hair algae from chaeto; the chaeto must just be harvested earlier instead. For algae scrubbers, green hair algal growth on top of more green hair growth is how scrubbers operate in the first place, so earlier harvesting is not needed. The key advantage I would see to running both like you are talking about is you might not have to be as aggressive with Zeovit and have a system that could deal with occasional things that happen that could throw a tank out of balance. Redundancy. Good points. The algae also makes oxygen and pods, and consumes CO2, which fills in where the zeo stops. It’s not recommended to run any algae reactors or scrubbers with ZEOvit, however, I don’t run a ZEOlite reactor on my system. I have a home built Cheato Reactor that the light is only on for 4 hours at night and the algae never needs to be trimmed. Lucky me. Not recommended, maybe. But the idea is to get the benefit of both. Zeo won't be adding any pods or oxygen, etc, but by possibly down-tuning the zeo you should be able to do both at some point. Can’t you grow pods in live rock and doesn’t your skimmer add oxygen?